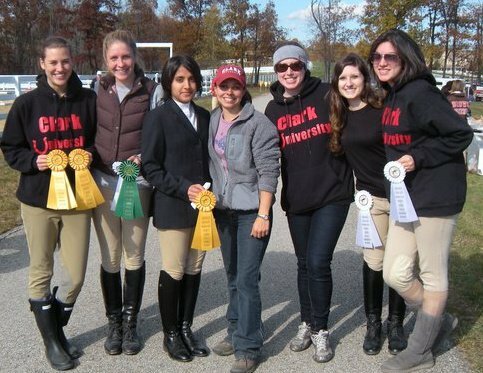 The Clark University Equestrian Team is a school subsidized club team. We compete in Zone 1, Region 1 of the Intercollegiate Horse Show Association. The team consists of riders of all different levels, ranging from walk/trot to intermediate divisions. The team rides at Belle Wood Stables, about 20 minutes away from Clark, with coach Kerrie Arcouette. Every team member takes one lesson a week with two to three other team members. We are a year long sport, and anyone who is interested may try out at the beginning of the school year.